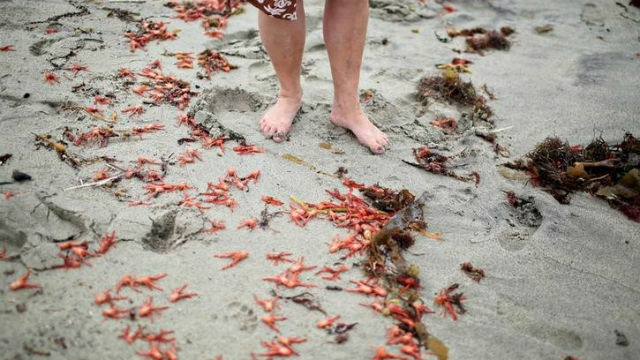 Masses of tiny red crustaceans known as tuna crabs have washed up for a second straight year along stretches of the Southern California shoreline in a phenomenon marine scientists say is linked to warmer ocean currents flowing up the coast. Waves of the dead or dying tuna crabs have been found carpeting the sand at various San Diego and Orange County spots, including Imperial, Huntington and Newport beaches, since the middle of last week. The crabs are typically concentrated in Mexican waters off the southern and central Baja Peninsula, but warming currents periodically carry the crustaceans farther north and closer to shore, according to scientists. The latest event and a similar mass stranding of tuna crabs last June along beaches from San Diego to Orange County coincided with the El Niño effect, which alters ocean temperatures and currents in the eastern Pacific. Also known as pelagic red crabs, the bright salmon-colored creatures resemble small lobsters or crayfish, measuring 1 to 3 inches (2.5-7.5 cm) in length. They are a favorite delicacy of some species of tuna, hence their common name. Their scientific name is Pleuroncodes planipes. Unlike most crabs, they largely spend their lives grazing on phytoplankton as they swim freely in open water rather than crawling along the sea floor, though larger adults will make excursions to the bottom, according to the Scripps Institution of Oceanography in La Jolla. Because they live in the water column, the crabs drift with the winds, tides and currents. Linsey Sala, a Scripps scientist, said the latest influxes of the tuna crab appear to have established a longer-term population of the crustaceans that may linger in the waters off Southern California for a number of years. Scientists advise the crabs are not safe for human consumption because they may have ingested toxin-producing plankton.